1) This peer reviewed paper was presented at the FIG Working Week 2016 in Christchurch, New Zealand. The article presents the evaluation of grassroots stakeholders’ accessibility to the land administration, and to the development of a modern land administration system in Vietnam. The trend in modern land administration systems towards e-land administration aims at improving access to land information and services for all stakeholders. Vietnam is no exception in this trend. The government has made large investments to develop the land information and registration system with the strong support from donor-funded land registration projects. One aim of land registration and titling is to build a transparent land administration system. Most investments have focused on the development of a computerised system to improve land administration delivery services. However, there have been some technical and non-technical factors which have become barriers to the implementation of an effective land administration system in the country. 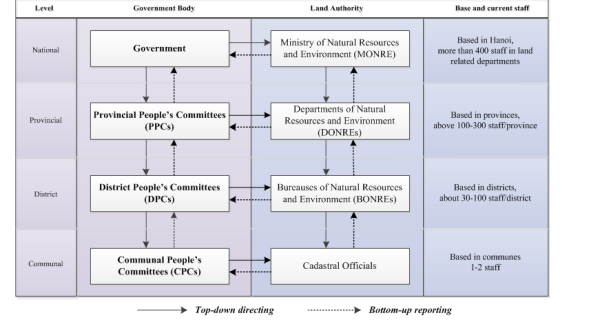 This paper presents the evaluation of grassroots stakeholders’ accessibility to the land administration, and to the development of a modern land administration system in Vietnam. This research is based on a case study which investigates the challenges for development of a conceptual spatial data infrastructure to increase access to land information by all stakeholders in Vietnam. Xu hướng hình thành hệ thống quản lý đất đai hiện đại tiến tới hệ thống quản lý đất đai điện tử cải thiện sự tiếp cận thông tin và các dịch vụ đất đai cho tất cả các đối tượng có liên quan. Việt Nam không nằm ngoài xu hướng này. Trong thời gian vừa qua, Chính phủ Việt Nam đã đầu tư một lượng kinh phí lớn trong lĩnh vực đất đai với sự hỗ trợ mạnh mẽ từ các dự án tài trợ. Mục tiêu của công tác đăng ký đất đai và cấp giấy chứng nhận quyền sử dụng đất là tiến tới xây dựng một hệ thống quản lý đất đai minh bạch. Hầu hết các dự án đầu tư đã tập trung vào việc phát triển một hệ thống thông tin đất đai để dần cải thiện dịch vụ quản lý đất đai. Mặc dù vậy, có một số hạn chế cả kỹ thuật và phi kỹ thuật đã cản trở việc thực hiện một hệ thống quản lý đất đai có hiệu quả trên cả nước. Bài báo này trình bày kết quả khảo sát việc tiếp cận thông tin và các dịch vụ đất đai của người dân ở cấp cơ sở và đánh giá sự phát triển của một hệ thống quản lý đất đai hiện đại ở Việt Nam. Nghiên cứu này được thực hiện trên một địa bàn cụ thể, khảo sát những khó khăn, thách thức trong việc phát triển một cơ sở hạ tầng dữ liệu không gian để tăng cường tiếp cận thông tin đất của tất cả các bên liên quan ở Việt Nam. Land and geographic information underpins many of the objectives and strategic goals of governments, including natural resource management, environment monitoring, land-use control, climate change adaption, and disaster risk management, as well as socio-economic development. Spatial and non-spatial information about land are important for government in land management and administration decision-making, but also for landholders in making decisions about their land. The role of spatial information to support decision making of local, national, regional and global issues was recognised more than two decades ago at the Rio Summit (1992), and is still central to discussions about the Sustainable Development Goals. Land information has often been described as an element which presents the location of resources and helps people to understand the relationships between real objects and resources. This concept enables the visualisation of resources’ locations to support planning and management. Land administration assists in the protection of scarce community resources by allocation of the rights to them, creation of restrictions on them; and establishment of responsibilities of related stakeholders. The utilisation of spatial data and services allows decisions to be made about optimising the use of land and becomes one of the key principles for sustainable management and development (Muggenhuber, 2003; Steudler & Rajabifard, 2012). Furthermore, the security of land use rights (land tenure), together with information about access to land, has been identified as important for the reduction of poverty (FAO, 2012; Maxwell & Wiebe, 1999; Quizon, 2013; Widman, 2014) and meeting the broader sustainable development goals objectives. The Voluntary Guidelines on the Responsible Governance of Tenure of Land, Fisheries and Forests in the Context of National Food Security (FAO, 2012) calls on States to recognise, record, and respect all legitimate rights to land. The way that land rights may be recorded is in the formal land administration system. However, it is often stated that approximately 70% of all land rights globally are not recorded in the formal land administration system. In Vietnam, information on property rights, including land use rights and related land information, has recently been recognised as an important competitive indicator to attracting investors at the provincial and municipal level (Malesky et al., 2015). According to Thu and Perera (2011), access to land is a sensitive issue that may hinder foreign and private investments, as the stability of land use is a factor that multi-national enterprises consider when investing in Vietnam. Stakeholder understanding of, and participation in, land administration process is an important element in land administration delivery and the provision ofland-related services. A transparent land administration system requires active participation by individuals, households and organisations to increase access to land informaiton. As the largest user, grassroots stakeholder’s understanding and participation are critical when assessing the development, implementation, and maintaince of land administration. Since the late 1990s, the Government of Vietnam has made large investments to develop a modern land administration system including land registration and the issuance of Land Use Right Certificates (LURCs) with the strong support from international donors such as Australia, Sweden, ABD, and The World Bank Group (World Bank, 2010). Such a modern transparent system will contribute a good governance and strengthen the trust of local people in land services and activities. The institutional arrangements have been improved by separating the state administration organisations and public service provision units, together with the establishment of a unified and decentralised system of land administration at all levels over the last decade (Vietnam National Assembly, 2003; World Bank, 2009). However, there has been a considerable gap between the land policy and its practical implementation to ensure the access to land by stakeholders. For instance, the standard requirements for land registration offices have not yet been developed and applied, while the procedures for the land titling process have retained complexity which may encourage corruption in the land sector (Embassy of Denmark, Embassy of Sweden, & World Bank, 2011). There has been an estimated $60 million of investments per year for cadastral survey and mapping, including procurement of surveying equipment and technical services (World Bank, 2011). However, several reviews have reported limitations in the land sector in Vietnam, especially in term of ensuring and increasing efficient access to land information by stakeholders. As a consequence, over the last few years the land sector in Vietnam has been rated in the top three sectors for corruption (DEPOCEN, World Bank, UKAID, & VTP, 2014; Martini, 2012; World Bank, 2010; World Bank & Government Inspectorate of Vietnam, 2013). There have been both technical and non-technical issues that have caused problems. In particular, land administration related services and activities, and accessibility to land information for land users, needs further development. This paper presents the results of one element of a PhD research project being undertaken to develop a conceptual spatial data infrastructure model for land administration system (SDI Land) in Vietnam with a case study of Vinh Long Province (hereinafter called Vinh Long). The model aims to increase access to land information by all stakeholders. This paper considers the information needs of one group of these stakeholders - those at grassroots level. This research employed a multi-method setting using a case study strategy that includes both quantitative and qualitative methods. The qualitative methods involved interviews of related stakeholders, including managerial officials, policy makers at the central ministries, and technical and managerial staff at provincial level, international organisations, donors, private and academia sector as well as community members through personal interviews and focus group discussions. The quantitative methods included questionnaires about people’s attitudes, thoughts, and evaluations of engaging with land registration services at the government agencies; the difficulties encountered, and deficiencies and expectations in accessing land information. The grassroots stakeholder consultation was conducted in Vietnam in late 2013. Three focus group discussion meetings and 160 individual and household questionnaire survey were conducted in Vinh Long. The selection of participants was made randomly by third parties to ensure the nature of collected data and the voluntary participations. However, there was a balance in both gender and cultural background for the participants of focus group discussions and questionnaires at the grassroots level. As the research involved human participants, the ethical issues were considered and approved to conform to the Australian National Statement on Ethical Conduct in Human Research before the fieldwork conduction. The data collection was in Vietnamese language and was then analysed by computer-aid data analysis software packages, including MS. Excel and QSR NVivo. In Vietnam, land belongs to whole population, managed by the State and while private ownership of land is not recognised, land use rights can be issued (Vietnam National Assembly, 2013a). The State recognises and protects the land use rights of land users (Vietnam National Assembly, 2013b). In this context, as a special property, the meaning of the term land use right in Vietnam is not significantly different to the meaning of land ownership. In other words, it is the most secure form of tenure for landholders in Vietnam. In certain areas LURCs are allocated to individuals, households, organisations, and communities (hereinafter called land users) to use stably. No LURCs are issued for land on which land use rights have not been allocated, and this land remains under the control of the State. LURCs are essentially usufruct rights, meaning that the land users may use land, but cannot own the land. Land use rights entitle land users to exchange, transfer, inherit, mortgage, lease, sub-lease, bequeath and donate land use rights, guarantee and contribute capital using land use rights (Vietnam National Assembly, 2003). According to data from the General Department of Land Administration (GDLA), as of 2013, about 90% of agricultural land area, 75% of urban residential land area, 90% of rural residential land area, and 70% of forestland area had been issued LURCs. However, cadastral records, including cadastral maps, are largely incomplete, inaccurate, and out-of-date; and thus cannot support the needs of land related services delivery. By the end of 2014, there has been only about 20% of LURCs issued with the names of both spouses as promoted and regulated by land laws and policies. The system itself is cumbersome and inefficient, lacks transparency, and has not yet provided the end-users with quality services. As a result, it is difficult and costly to conduct land transactions or to use LURCs for mortgaging to access to credits. Vietnam’s land policies are administered through a hierarchy of authorities at the central level, sixty-three provinces and cities, more than seven hundred districts and over ten thousand communal administrative units (including communes, wards and towns). The Vietnam land administration system is a multi-level and decentralised system. In 2009, GDLA was re-established under the Ministry of Natural Resources and Environment (MONRE) and has become the primary central level body in the country for land administration activities. GDLA is responsible for advocating with the other government agencies for necessary laws to reform public land, land registration and other land regulations for more efficient resource management system in the country. The activities of GDLA focus on state administration of land, directing and organising inspections of land nationwide and directing the surveying, measurement, drawing and management of cadastral maps, land use status maps and land use planning maps nationwide. GDLA is based in Hanoi. At the provincial and district levels, the natural resources departments as well as the Commune People’s Committees, supported by cadastral officials are responsible for land management within the administrative boundaries. Respectively, the upper level authorities provide guidelines to lower ones. Staff and organisations belong to respective people’s committees at the same level (Figure 1). Most of the land administration activities happen at the local levels. Located in the Mekong Delta region, lying between two major rivers in the area (Figure 2), Vinh Long plays an important role for agricultural production and is well known for fishing in the south of Vietnam. Like other traditional agricultural provinces, land is important to people for both residential and farming purposes. 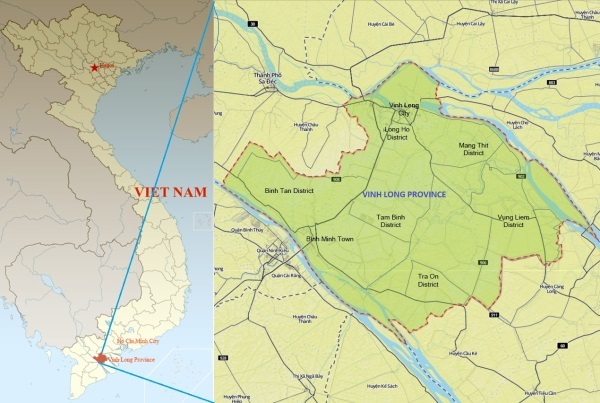 Vinh Long is the smallest province covering an area of approximately 1,500 km2 and has a population of 1.04 million (http://www.vinhlong.gov.vn/Default.aspx?tabid=1255 accessed on August 21, 2015) over approximately 265,000 households with a density of 700 people /km2. The Province is subdivided into eight district-level administrative units including six districts, a district-level town, and a city; 109 communal-level administrative units, including 94 communes, 5 communal-level towns, and 10 wards. Vinh Long was one of nine provinces covered by a World Bank funded project (VLAP) implemented during 2009-2013, and extended and closed by end of 2015. The Province was considered as a lead province in the project implementation with good progress, strong commitments of provincial leadership, and the active participation of land users during the project implementation. The figure of land tenure in the Province as of 2014 is presented in Table 1. The land administration system of Vinh Long is similar to the other provinces with the DONRE belonging to PPC and nine BONREs at district level. At the provincial and district levels there are land registration offices organised to deal with all land administration activities related to grassroots stakeholders. Cadastral officials at communal level assist with the CPCs and BONREs land management related activities. Three communal administrative units were selected including Ward 2 of Vinh Long City, Trung Thanh Tay and Trung Hiep communes of Vung Liem District to represent for all three urban, peri-urban and rural communities. The selection was based on number of criteria including technical, professional and organsational development as well as academia collaboration of the provincial leaders in the land sector. Demographical distribution and geographical range were also taken into consideration of the case study areas. Other criteria included the availability of as many land services as possible, the commitment of provincial leaders and the accessibility of investigators. Land tenure profiles of the three communes were similar to the whole province as shown in Table 1. These following sections present the results of the interviews, focus group discussions and questionnaires and reflect the accessibility of grassroots stakeholders to land administration related information and services through a variety of research methods. These sections firstly discuss the understandings of local people on land use rights and their importance to them then present the findings on the barriers and issues of land related services and the recommendations on the land administration before analysing the accessibility to land information at grassroots level. Of the 122 questionnaires responses, 104 individuals and households (equivalent to 84.6% of participants) had been granted LURCs. This is a large number in comparison with the average percentage (72%) reported by provinces to the MONRE (World Bank, 2010) and the figure as of 2013 reported by GDLA. However, only 69 (equivalent to 56.6%) are residential LURCs. Of the 122 households questioned, 75 (about 61%) indicated that they sufficiently understand what their land use rights are (Table 2). However, the majority of participants of the focus group discussions considered that they are not really good at understanding the land use rights mentioned in the Law on Land and related legal documents due to the complicated technical interpretation and understandings. There was little difference in understanding of land use rights between men and women in relation to their understanding of their rights to land (including restrictions and responsibilities) are shown in Table 2. Slightly fewer men (78.26%) stated that their understanding of land use rights were at the level of competence or higher, compared to women (79.25%). These results reflected the benefits to women of public awareness campaigns undertaken under VLAP during the last few years. Also, the understanding of land users did not differ depending on whether they had been granted or not granted LURCs. In the urban area focus group discussions, about 80% of attendees perceived that they understood their land use rights sufficiently. Some of them could list the rights of land users set by the law; others could do this in languages that differentiated terms from the language used in the legal documents. They could also provide examples for others to understand and match the ideas. Even though individuals were aware that they could mortgage their LURCs to access to loans from the commercial banks, they still were confused about the procedures and the credit thresholds for borrowing. Although, the majority of attendees were unaware the value of their land, a few of them had mortgaged their LURCs for access to credit. In most cases, land users did not understand the procedures of land valuation. Borrowers simply believed the commercial banks had applied the right prices set by the government. The observation and discussion with local people suggested that due to the limited size of loans and the complicated procedures, many land users, especially the farmers hesitated contacting the commercial banks to access credit. Disregarding high interest rates and risks, farmers still seek “black credits”. Table 3 presents the results of questionnaire on the importance of land use rights. Participants were asked to score the relative importance to them of six property rights related to their land use rights – as given by the Land Law 2003 (Vietnam National Assembly, 2003). Overall, 81 respondents (66.4%) indicated that the land use rights are important or very important, whilst only 13.1% of respondents addressing that the land use rights are either very unimportant or unimportant. The rest 20.5% of respondents perceived that the land use rights are neutral (neither important nor unimportant) to them. Within the six fundamental property rights of land users listed above, inheritance of the land use right was evaluated as the most important right by over 103 (84.4%) participants. The next most important was the exchange of land use right by 92 (75.4%) respondents. Additionally, the field observation suggested that the exchange of land use right supports land users, particularly farmers, to exchange land use for expanding the farming investments. One respondent shared their experience of using lease or sub-lease of land use rights. No respondent mentioned that guaranteeing the land use right would bring benefits to them. Nevertheless, there was misunderstanding about the two terms ‘guaranteeing’ and ‘mortgaging’ the land use right, which was identified when the participants discussed the ease of accessing credit by using LURCs. In summary, the above results have shown the importance of land use rights as well as the benefits of issuing land use rights certificates to land users. However, a small number of land users successfully accessed credit by mortgaging the land use right. Land users, especially in rural areas were still unwilling to, or faced difficulty in, dealing with commercial banks for loans. This section presents and discusses the experiences of land users participating in land registration services. The results are presented in Table 4. There were 120 participants answering these two questions. Approximately one-third (32.92%) of respondents indicated that administrative procedures were the largest barrier for them to do land registration. The next largest barrier was considered to be limitations in land use planning information with an average of 22.08% of respondents. However, there was a difference in the responses for selling and buying land. While 22.13% of sellers revealed the limitations in land value information being the second largest factor; 25.41% of buyers acknowledged the difficulty in accessing land use planning, which relates to land use purpose, land recovery and acquisition, and land compensation being the second impact for them to decide. Time taken to process the service was not considered as a barrier for the majority of sellers and buyers. Of the responses, just thirteen sellers and four buyers stated that time-consumption was the factor in completion of land registration. These figure made an average of 7.08% of responses. There was a similar response regarding land related administrative procedures at the focus group discussions. Overall, 17.65% of responses stating that the administrative issues were significant reasons preventing them from participation in land registration process. The figures were similar at the three meetings, all between 17-20% of responses. At the focus group discussions, only one respondent mentioned time consumption in land administration services as a big issue. However, some other attendees agreed that the land registration services took longer time than the regulation, especially in applying for LURCs. Limitations exist in the dissemination of land use planning information as people interviewed perceived that they had to directly or indirectly contact cadastral officers to access land use planning information. Approximately 12% of participants indicated that they had informally transferred land over three communes. Due to the only small number of respondents, the results are not conclusive. However, they provide some indications of the factors in informal land transactions. The reasons varied and came from financial issues, administrative procedures, timing, and legal status. Of the participants who had transferred land informally, 69% stated that the complicated administrative procedures as the main barrier, while legal situation was the reason not doing registration of the 23%. According to the Land Law, land users could only transfer land officially providing that the land parcels have been issued LURCs (Vietnam National Assembly, 2003). Time consumption was not accounted as an issue to people as only one respondent accounted this as a reason (Table 5). There was also discussion on transferring rural land informally in focus group discussions and it was suggested that if the land users occupy and use land over a period of time, especially for agricultural production in areas without new land planning projects, they do not really need LURCs. Individuals and households were asked to evaluate the support of local land administration authorities in specific land related services and activities, included exchanging, transferring, inheriting, mortgaging, leasing, sub-leasing, and guaranteeing land use rights, and two common activities, applying for LURCs and land subdivisions. Figure 3 describes the comparison of the satisfaction of land users to the support of local land authorities and officers in different services and activities. Overall, 55% of respondents were satisfied with land administration services and activities. People evaluated highly (74% and 66% acceptable) the support of local staff for applying for LURCs and land subdivisions. . While the LURCs application activities establish the initial legal framework to implement other rights under land related services, the subdivisions of land parcels occur more often in the rural and peri-urban areas due to the expansions of families and urbanization process. These results could be categorised into three groups. The most common services and activities (an average of 67.5%) including inheritance of land use rights (63%), subdivision of land parcels, and application for LURCs received the significant support from local authorities and staff (74%). The less common services (an average of 53.5%), including transfer, exchange, and mortgage land use rights received the acceptable support of local government offices such as land registration offices, cadastral officers, and financial institutions, as well as heads of villages, ranging between 52% and 56%. The service relating to less common processes (an average of 37.7%), including guarantee by land use right and lease, sub-lease of land use right, received the lowest support of government agencies, with about 30% to 40% of respondents satisfied. On the other hand, there were 45% of respondents dissatisfied with the delivery of land related services of local related authorities and officers. Many evaluated the support of the local related staff and authorities being below requirements (43%), and even far below their requirements by the rest 2%. The results of questions on the quality of support provided by local government authorities and staff were categorised by commune as shown in Table 6. The scores were computed based on the participants’ responses under a Likert scale ranging from ‘very poor’ to ‘very good’. Each choice is given a numerical value and a mean figure for all the responses is later computed. For example, in this case, a score of 1 relates to ’very poor’, 2 means ’poor’, 3 means ’fair’, 4 means ’good’, and 5 means ’very good’ in support of government authorities and staff. Overall, the support provided by local government authorities and staff in rural and peri-urban areas were evaluated higher than for the urban area, except for the process of ‘applying for LURCs’ in the rural area. ’Applying for LURCs’ received the highest score in both urban (3.00) and peri-urban (3.57) areas, with the support of government authorities and staff for this service being evaluated as between fair and good. On average, this service also received the best evaluation of stakeholders across all three communities with an average score of 3.07. The lowest evaluation was for the service ‘guaranteeing land use right services’ in urban area (2.20) with the service receiving the lowest score across all communes was ‘support for leasing, sub-leasing land use right’ (2.43). The support for activities on ‘lease and sub-lease of land use rights’ received just only one comment. This suggested that the activities on leasing and subleasing land use rights at local level were considered straightforward. The urban focus group discussions confirmed that the support of government authorities and staff for ‘applying for LURCs’ was the highest. The three focus group discussions also confirmed that the lowest level of support was considered to be for the sub-leasing service being consistent with the result presented in Table 3. Of 122 participants, 96% indicated that land-related information is important to them. Of these 73% stated that the land related information is essential in all aspects, including legal and policy information, technical information, and administrative procedure information. The information about LURCs was evaluated as the most important to the land users, especially in rural and peri-urban areas with the scores of 4.91 and 4.73 respectively (between ‘important’ and ‘very important’). Information about LURCs includes land titling implementation plans, administrative procedures, documents, and supporting documents needed for applying for LURCs. On the other hand, cadastral maps and sketches and information on land mortgage were evaluated at the lowest levels of importance to land users with the scores of 3.82 and 3.78 , respectively – between ‘neutral’ and ‘important’ (Table 7). The related topics were discussed in all three focus group discussions which found that these results reflected partly the demands and understandings of local individuals and households on land information. Participants, especially for those who living in rural and peri-urban areas expressed the importance of land value information and land use planning. The discussion suggested that more than half of responses at the rural focus group discussion and about 70% of responses at the peri-urban focus group discussion considered this information most important to them for making decisions on land use. Participants also considered that access to land plans, including land use planning was difficult. Land value information is published under an administrative decision of a committee without representing this information on valuation maps. This lacks transparency and makes it hard for citizens to access information on land values. A minority of participants required cadastral maps and sketches as well as land mortgage information. People living in areas covered by the VLAP were provided technical land parcel sketches by surveyors during the surveying period for verifying information related such as names, boundary lengths, and parcel dimensions. They were asked to provide feedback on the results of surveying for revision, and most focused on land boundary marking and adjudication. This is one way the surveyors and government agencies mobilising people to participate in land data collection. However, individuals can often only verify information such as names, addresses, and ID numbers. It is hard to verify the accuracy of the parcel dimensions and areas. Nevertheless, this is a good process for correction of data from the local stakeholders. The above section presented the evaluation of land users at grassroots level on the importance of land information. The results show that, despite the different responses, individuals and households have significant demands for land related information. This section presents the accessibility to land information and land documents by stakeholders and also discusses the barriers that individuals and household faced (as shown in Table 8). Access to land-related ‘administrative procedures’ and ‘LURCs’ were easier than the other types of information. Over half of participants (52%) acknowledged it was easy to access these two basic types of information related to land. On the other hand, people at grassroots level faced difficulty accessing information on ‘land law and policies’. The results in Table 9 show that respondents found the ‘LURCs’ the most accessible while the other documents are neither easy nor difficult to access. The result was confirmed by the outputs of focus group discussion meetings based on the responses to the question about the difficulties people experienced when participating in the government land registration process. According to the discussion, about half of attendees agreed that the best way to access land related information for them was to approach the local authority officers. Some attendees stated that they could access information by visiting public display sites of local offices. The information they could find included the list of qualified and disqualified applications for LURCs; information on land fees and tax; information on compensation, support and re-settlement plans (in some specific projects containing land recovery). Participants were also asked about the accessibility of land documents including: LURCs, cadastral maps and parcel sketches, land use planning maps and documents, and land valuation information. The result shows that the accessibility to LURCs was evaluated as the easiest. This is consistent with the results in Table 9. Surprisingly, access to ‘cadastral maps and parcel sketches’ and ‘land use planning information’ were more difficult to access despite the related legislation listing these as mandatory information needed to be publicity accessed by stakeholders (Vietnam National Assembly, 2003). At the focus group discussions, almost all participants revealed that it was easy to find information about the LURCs. However, the information about the ‘land use planning’ and the ‘legal dimensions’ (through the maps) of land parcels was hard to access. Some participants advised that they found it difficult to get enough land use planning information and documents when they want to buy more land. Access to information and documents is an important indicator for reducing rural poverty in developing countries (Binswanger-Mkhize, Bourguignon, & Brink, 2009). Experiences from grassroots levels show that the land disputes are often about land boundaries, and disputes can be reduced through the cadastral survey, mapping and adjudication process with the participation of land users and providing a clear mechanism for accessing land related information and documents. An average of57% of participants indicated that they faced difficulty in accessing land related information, mostly because of the information was unavailable or out of date (both 71%). Complicated terminology and high fee rates for accessing information were also barriers with 57% of participants (Table 10). Even though the communal offices are responsible to make information publicity available, landholders still face difficulty in all of aspects of accessing land information: quality (out of date, complicated terminology), quantity (not available), timing (out of date, not available) and financial (high fees) manners. The manual methods required to access land information and documents and the roles of individuals have reduced the level of accessibility of citizens to land information. This is one of the aims in the development of an SDI Land proposed under the current research. There was uneven result among the methods of providing information for citizens, including mass media such as television, radio, and newspapers (both print and online versions) to local measurement including village meetings, poster and leaflet. Table 11 compared the evaluation of individuals on the effectiveness of the dissemination of land information to citizens. Surprisingly, the most difficult way to access land information was through the Internet. Approximately half (47%) of the participants indicated that it was hard to access land information by searching on the Internet. Only 18% responded that they could easily do this via the high-tech and speedy search engines. The figure again reflected the weak dissemination of information about laws and regulations over the Internet. According to the Law on Land, Law on Urban Planning, the publication of information on land, such as urban planning (both draft and approval ones) needed to be made mandatory on the Internet through the websites of provincial people’s committees or relevant organisations. This result consisted with the data showed in Table 10 with 71% of participants stating that out of date or unavailable information made them unable to access suitable land information. Information on charges, fees and taxes related to land including charges and fees for applying for LURCs, extracting cadastral maps, extracting legal status of land parcels, land mortgaging, land subdivisions. In contrast, local village meetings were still the most effective channel for people to find and seek information (4.06 – between ‘easy and ‘very easy’), especially on land use planning and LURCs. The field observations suggested that, similar to the other traditional villages in the country, the heads of villages in the case study areas often organised meetings (officially or unofficially), usually at nighttime to gather villagers for the dissemination of information. In these meetings, the villagers are provided with general information such as land use planning, new project implementation plans, and land taxation apart from the other information on the agricultural schedules. Firstly, the analysis shows that land use rights are significant to grassroots stakeholders, both those with or without LURCs, and for both male and female. The issuance of LURCs establishes the legal framework to protect land tenure of the stakeholder at the highest level. LURCs provide the legitimate and formal right to access to land. Secondly, there is a significant demand from grassroots stakeholders for land related information, in both spatial and attribute data formats. The analysis suggests that the land information plays an important role for landholders to make decisions. However, the accessibility to land information still remains weak, especially for spatial data (mapping), land use planning, and land value information. According to the Land Law, information regarding administrative procedures for land use certificates, cadastral maps, land use planning and land value is mandatory published in a number of ways and forms for citizens to access openly and freely. The land administration system should ensure the information is available and updated with an appropriate infrastructure for provision of information. The analysis suggests limitations in land administration processes have placed barriers to accessing land information. The reasons include the unavailability of information, out of date information, complicated terminology, high fee levels, and permission requests. In addition, the use of the Internet to delivery land information has been ineffective which suggests that and further development of SDI must recognize the important role of the traditional village level sharing of information in a variety of forms. However, the younger people will increasingly look to the Internet for land information. By 2013, there had been more than 31 million Internet users in Vietnam (MIC, 2013). The huge number has been still rapidly increasing over the last few years and predicted to be doubled in 2016. The figure shows the potential of information provision on Internet is huge as websites can offer quick access to information for stakeholders simply with a connection. On the other hand, the related laws and regulations have already outlined the types of information that must be published online or not online. In fact, despite the rapid increase of number of the Internet subscribers in the country, the usage of this technology for dissemination of land related information has been still limited. Investment in an efficient infrastructure such as a land portal would make the accessibility to land information available and easy. Thirdly, local government land authorities and staff should be provided with ongoing training under ongoing capacity building programs. In order to improve accessibility of government land information to citizens, this should include customer service training and improvements in efficiency. The benefit to the State is that this may reduce the percentage of people who transfer land under informal land markets, bringing them into the formal economy. Lastly, public awareness rising campaigns should be implemented more often to local stakeholders. Initially, individuals and households need awareness of the importance of LURCs to ensure their land tenure security. Land users should also be informed their rights, restrictions and responsibilities fully to avoid social risks of implementation of land use rights. For instance, participation in LURCs process and land registration will reduce land disputes and complaints which often happen at grassroots level. Traditional village level forums continue to be important for awareness raising. At the higher level, land users should be guided to seek and request land information they need by using one-stop shop and the Internet via a land portal. The paper describes the results of stakeholder consultations on accessibility to land administration in case study areas. Participants living in the study areas perceive that LURCs and related services are the most important to protect their rights on land and understand their land use rights competently. The demands of access to land, land information, and land documents have been recently increasing. However, the level of accessibility to land information still remains low. There has existed an inefficient link among government agencies for accessing and sharing data efficiently and effectively. The results have included evaluations of limitations, and barriers which could support to improve the land administration system, reform land administrative procedures, raise awareness for local citizens, and building capacity for government staff. Binswanger-Mkhize, H. P., Bourguignon, C., & Brink, R. v. d. (2009). Agricultural Land Redistribution: Toward Greater Consensus: The World Bank. DEPOCEN, World Bank, UKAID, & VTP. (2014). Land Transparency Study: Synthesis Report. Hanoi, Vietnam. Embassy of Denmark, Embassy of Sweden, & World Bank. (2011). Recognizing and Reducing Corruption Risks in Land Management in Vietnam (Reference book). Hanoi, Vietnam: National Political Publishing House. FAO. (2012). Voluntary Guidelines on the Responsible Governance of Tenure of Land, Fisheries and Forests in the Context of National Food Security. Rome, Italy: FAO. Malesky, E., Tuan, D. A., Thach, P. N., Ha, L. T., Lan, N. N., & Ha, N. L. (2015). The 2014 Vietnam Provincial Competitiveness Index: Measuring Economic Governance for Business Development. Hanoi, Vietnam: Labour Publishing House. Martini, M. (2012). Overview of corruption and anti-corruption in Vietnam. U4 Expert Answer, 315. MIC. (2013). Vietnam White Book on Information, Comminication and Technology 2013. Hanoi, Vietnam: Information and Communication Punishing House. Muggenhuber, G. (2003). Spatial Information for Sustainable Resource Management. International Federation of Surveyors: Article of the Month, September 2003. Quizon, A. B. (2013) Land Governance in Asia: Understanding the debates on land tenure rights and land reforms in the Asian context. Vol. 3. Land Governance in the 21st Century: framing the debate series. Rome, Italy: The International Land Coalition. Steudler, D., & Rajabifard, A. (Eds.). (2012). Spatially Enabled Society. Copenhagen, Denmark: International Federation of Surveyors (FIG). Vietnam National Assembly. (2003). Law on Land 2003. Hanoi, Vietnam. Vietnam National Assembly. (2013a). The 2013 Consitution of the Socialist Republic of Vietnam (adopted by National Assembly Term XXII at its sixth Session on November 28, 2013). Hanoi, Vietnam. Vietnam National Assembly. (2013b). Law on Land 2013. Hanoi, Vietnam. World Bank. (2009). Vietnam Development Report 2010 - Modern Institutions. Hanoi, Vietnam: Joint Donor Report to the Vietnam Consultative Group Meeting (December 3-4, 2009). World Bank. (2011). Report of the Study on National Spatial Data Infrastructure Development Strategy for Vietnam. Hanoi: WB Joint Working Group of the World Bank and Ministry of Natural Resources and Environment. World Bank, & Government Inspectorate of Vietnam. (2013). Corruption from the Perspective of Citizens, Firms, and Public Officials - Results of Sociological Surveys. Hanoi, Vietnam: National Political Publishing House. Mau Duc Ngo commenced his PhD study on SDI for land administration at the School of Mathematical and Geospatial Sciences of RMIT University in July 2012 as an Australia Development Scholarship (ADS) awardee. The research investigates the development of SDI and aims to develop and implement an SDI model for land sector in Vietnam to enable data updating and sharing as well as access to land information by all stakeholders. Mau has been working for the General Department of Land Administration (Vietnam) since 2001. He holds a BSc in Land Administration and a MEng in Urban Planning and Management. David Mitchell is an Associate Professor at RMIT and a licensed cadastral surveyor. He has a PhD in land administration. David is co-chair of the GLTN Research and Training Cluster, and member of the GLTN International Advisory Board. At RMIT University he teaches cadastral surveying and land development and undertakes research focusing on the development of effective land policy and land administration tools to support tenure security, improved access to land and pro-poor rural development. He also has a strong research focus on land tenure, climate change and natural disasters. Donald Grant was the New Zealand Surveyor General until February 2014 when he took up the position of Associate Professor in Geospatial Science at RMIT University. He holds a BSc Honours in Physics from Canterbury University, a Diploma in Surveying from Otago University and a PhD in Surveying from the University of New South Wales. He registered as a surveyor in 1979 and is currently registered as a Licensed Cadastral Surveyor in Victoria. Nicholas Chrisman was Head of Geospatial Disciplines at RMIT University until December 2014. He is a Professor and holds a PhD in Geography with more than forty years teaching experience at university level. Currently, he is an editor for Journal of Cartography and GIScience, published by Taylor & Francis. Nicholas has published two books and over a hundred scientific articles. He is a member of Panel on Developing Science, Technology, and Innovation Indicators for the Future, National Research Council (USA).